Posted on September 17, 2018 at 1:16 pm. 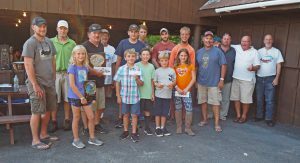 Here’s the 2018 Derby winners at yesterday’s Award’s Ceremony held at the Lake George American Legion Post 374. We had a great turnout this year and gave away some nice door prizes including a Garmin fishfinder/GPS unit. Thanks to all the entrants and especially the volunteers who make this event possible and grow every year. We are looking forward to the 2019 Derby.